B&G Foods (NYSE: BGS) reported earnings on Feb. 14. Here are the numbers you need to know. 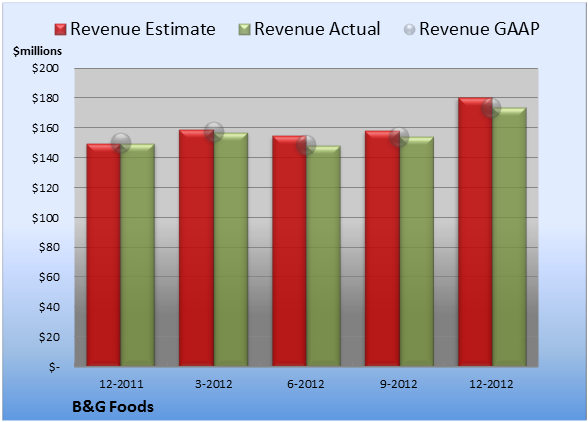 For the quarter ended Dec. 29 (Q4), B&G Foods missed estimates on revenues and missed estimates on earnings per share. Compared to the prior-year quarter, revenue grew significantly and GAAP earnings per share dropped significantly. B&G Foods reported revenue of $173.7 million. The four analysts polled by S&P Capital IQ expected revenue of $180.6 million on the same basis. GAAP reported sales were 16% higher than the prior-year quarter's $150.0 million. EPS came in at $0.32. The five earnings estimates compiled by S&P Capital IQ anticipated $0.39 per share. GAAP EPS of $0.18 for Q4 were 31% lower than the prior-year quarter's $0.26 per share. For the quarter, gross margin was 34.2%, 130 basis points better than the prior-year quarter. Operating margin was 21.5%, 10 basis points worse than the prior-year quarter. Net margin was 5.5%, 270 basis points worse than the prior-year quarter. Next quarter's average estimate for revenue is $173.8 million. 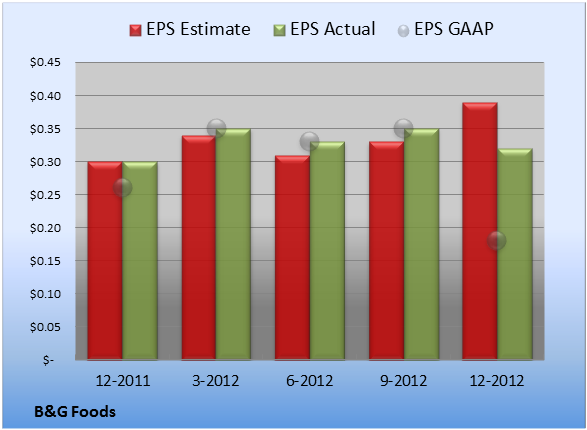 On the bottom line, the average EPS estimate is $0.38. Next year's average estimate for revenue is $701.5 million. The average EPS estimate is $1.53. Of Wall Street recommendations tracked by S&P Capital IQ, the average opinion on B&G Foods is hold, with an average price target of $30.20.